Cliff Art is an eclectic instrumental group whose music is extremely hard to classify. At the core of the group are Clifford M Laufer and Stuart Mawler. These two characters met via a mailing list on the internet called DIStrict of COlumbia area BOttom Liners (DisCoBoL). Of course, they were both bass players, but they knew that there would be music to create together. First, the story of the Cliff Art logo. . . The story of the logo is incomplete without the story of the name itself. Clifford and Stuart sat staring into space wondering what on earth to call this odd musical ensemble. They tried many things: "electric doorknob", "soft lampshade", and the like. Fortunately, none of these names seemed to fit. And "Cliff Art" was born. Oddly, Cliff and Stuart were not convinced that the name was a good idea until Stuart´s wife, Lea Ann, presented them with the "petroglyph" portraits seen on this site. Those portraits sealed the deal and the name stuck. Alternatively, fans have suggested that perhaps our name and our music originate in a caffiene-induced haze from all the coffee shops in which we perform. You make the call. Here are a couple of pictures from what was our favorite independent coffeehouse in Rockville, Maryland -- Peaberry´s. These pictures were taken by Heather James, using and Olympus digital camera. Contact Heather for more information. "Show me all the pictures"
Unfortunately, this fine establishment has closed its doors forever. This should come as a reminder that the arts scene needs your support in order to survive. Cliff is in the background on both pictures above. 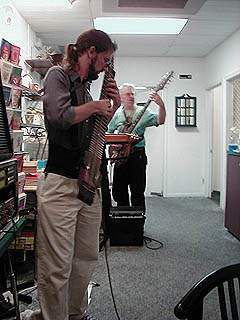 Cliff plays eight-string bass and Appalachian lap dulcimer with Cliff Art. Pictures on this site show Cliff with both electric and acoustic 8-string basses. Lately, he is only using the acoustic, which was built by Dave Maize, in Oregon. Be sure to come out and take a look and, more importantly, a listen. Growing up, Cliff played quite a number of instruments including guitar and clarinet. He has also been known to make appearances with the vocally-oriented group, Clam Chowder. Stuart is in the foreground on both pictures above. 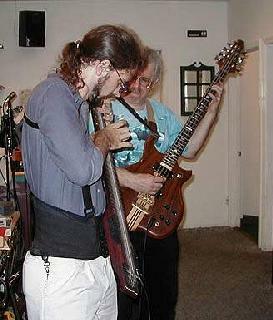 Stuart plays a "Grand" or 12-string Chapman Stick TM with Cliff Art, having taken up the instrument in 1992 or 1993. Before the Stick, there was bass. Stuart still plays six-string fretless bass, though not nearly as often as he would like. He picked up the bass guitar in high school because his friend had done the same. Dave plays Premier TM drums with Cliff Art, when there is a venue large enough to bring Dave along. He only acquired his first drum set in college, but quickly made up for "lost" time. We think he is down-right amazing. You will too. Dave's primary fondness would appear to be for cymbals. His kit contains a vast quantity of cymbals ranging in size from six inches in diameter up to 15 or more inches. You will have to come out and ask Dave more about them!